Come home and relax in your luxurious freestanding bathtub by Empava. From the serenity collection emerges the ergonomic pure-scape freestanding bathtub by Empava. Its design is as comfortable as it is stylish. The contemporary design and defined lines will complement any bathroom decor and make the room seem more spacious. The pure-scape stand alone tub is ergonomically engineered and will comfortably hold your body, so you can soak in peaceful tranquility. Empava uses 100% white glossy acrylic (never any paint) reinforced with fiberglass in its pure-scape bathtub to ensure that the color is consistent throughout and never fades or loses its brilliance over time. 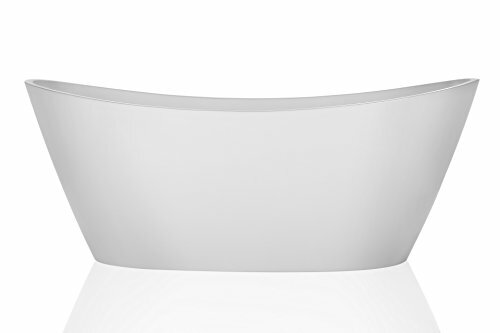 Stand alone bathtub features / specifications:, 66.92" long x 31.49" wide x 26.77" deep and an effective bathtub capacity of 58.11 gallons., Adjustable metal feet under tub for stability., Brushed nickel overflow and pop up drain., Anti-bacterial surface with high gloss white finish. CUPU certified., Premium quality acrylic construction reinforced with fiberglass for strength and durability., Non-porous surface for easy cleaning., Easy installation., 1 person bathing., Chrome plated overflow/drain available upon request (DIY replacement only)., 1 year warranty. Empava bathtubs are as pleasing to the eye as they are comfortable to soak in. World-class modern designs and ergonomic features are incorporated into all of Empava’s luxury tubs. From the finest selection of raw materials to the contemporary design, Empava bathtubs bring innovation and durability to create some of the highest quality, visually striking bathtubs in the world. Add the Empava modern freestanding bathtub to your cart today .